I’ve created a few themes in the 10 years that I’ve been a Moodler, some of which are even in production Moodle sites! 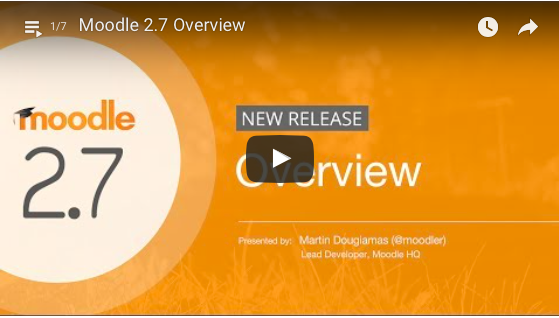 I am now proud to announce I will be facilitating MoodleBites for Theme Designers from June this year, which means the theme changes in Moodle 2.7 are even more important for me to share! Clean is now the default theme from Moodle 2.7. A new “More” theme has been introduced which provides a lot of settings via the Admin interface so Administrators can easily customise the colors, add an image as a background, add a logo and more quickly and easily! Bootstrap Base, Base & Canvas are still there but do not show in the interface as they are used as parent themes. I think this is a great move forward to clean out the additional core themes as many were redundant to the majority of users and cluttered the screen for Admins. Don’t panic however if you used one of the older themes or your own custom theme you can still use it! You should update your code then add your theme before running the upgrade. The previous core themes are available in the plugins database on moodle.org if you need the latest copy. Any settings you had will not be lost. As with any Moodle version upgrade it would be a good idea to double-check your theme. Navigate to pages like the gradebook, a user profile, module pages, forum posts and threaded conversations, the calendar etc to check it out.